Added on July 16, 2014 by Lara Hoke. I learned today that my painting of the South Bay (view from the Dumbarton Bridge) was accepted into BAYcentric, the August exhibition at the Pacific Art League in Palo Alto, CA. The exhibition will be up from August 1 through August 28 with an opening reception on Friday, August 1 from 5:30 to 8:00 p.m.
Hoke, South Bay, 2014, oil on panel 36 x 48"
Added on January 8, 2014 by Lara Hoke. This week I began two new paintings based on photographs taken while I was in Iowa over the holidays. Both pieces are of the snow covered landscape, appropriate given this week's weather news and the Polar Vortex. Iowa Snowscape, oil on canvas, 20 x 30"
Added on November 30, 2013 by Lara Hoke. Six years ago, when I first moved to the Bay Area, I thought the land around the Dumbarton Bridge was stinky, ugly, and to be avoided by any way possible. The last several years have seen a restoration of the area, from a solar salt industry back to native salt marsh. One of my clients is located in Palo Alto and once a week I drive over the Dumbarton Bridge. Last week, the bridge was a parking lot due to an accident near Facebook headquarters. Being stuck in my car for an hour gave me the opportunity to look at my surroundings and appreciate their beauty. I snapped several photos of the sky and the marsh. Later that week I began my first painting of the area. Added on September 17, 2013 by Lara Hoke. 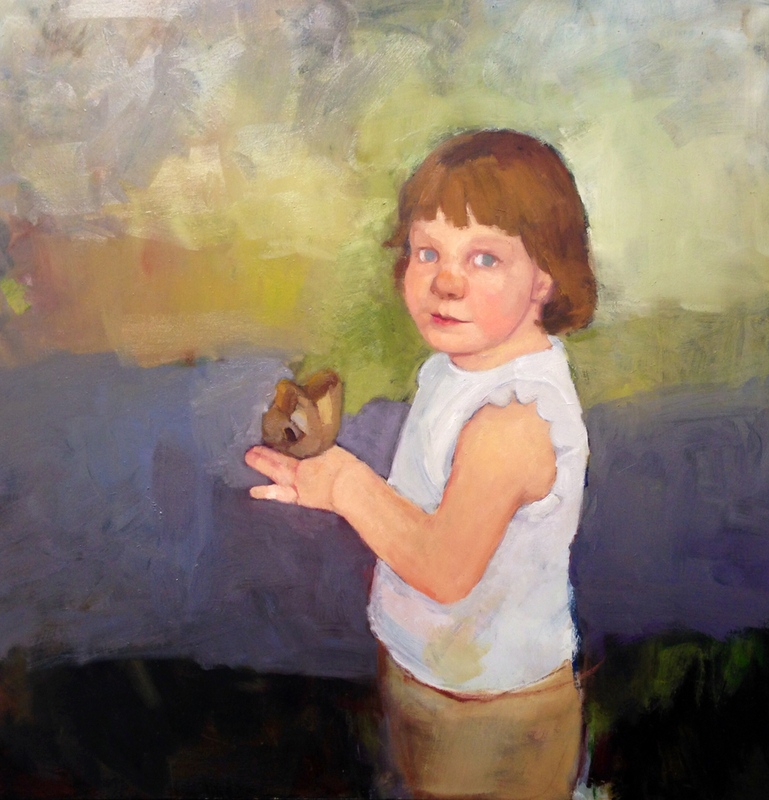 I'm working on a commissioned portrait of a young girl with a butterfly resting on her wrist. I'm capturing the day by day transformation of the piece. Below is the portrait from initial sketch to underpainting to somewhat more developed painting. Added on October 30, 2012 by Lara Hoke. This past weekend I took a two-day workshop on encaustic painting at Kala with the artist and paint maker Hylla Evans. Encaustic painting, also known as hot wax painting, involves using heated and pigmented beeswax. Learning a new medium and technique is both intimidating and freeing. What I ended up creating was nothing like what I expected to create. To learn something new is to take a risk. Added on October 18, 2012 by Lara Hoke. Below is the latest painting in my Oakland Nightscapes series. 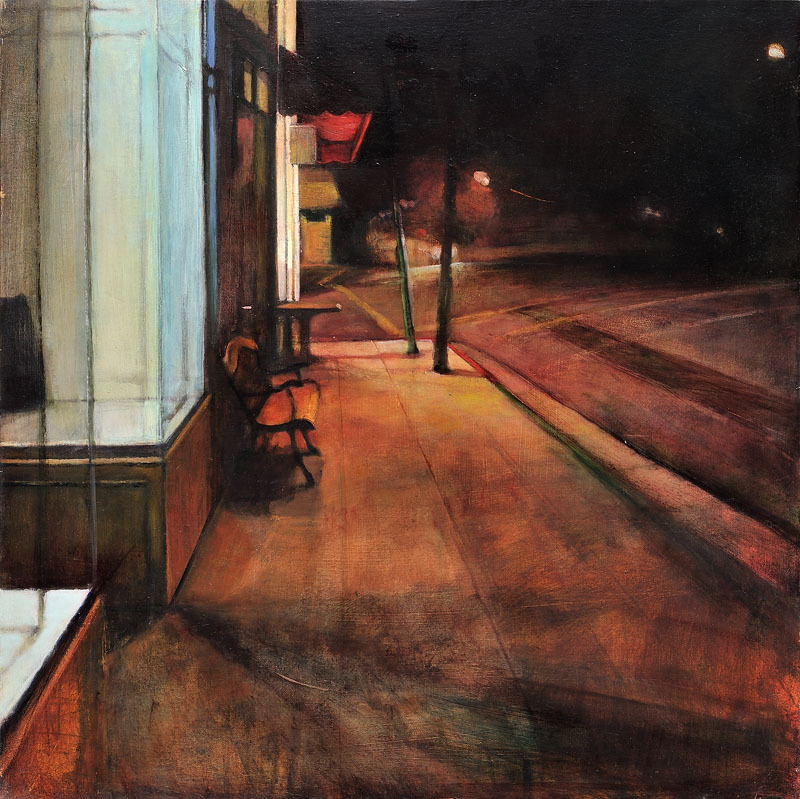 Unlike the previous paintings in the series, which were primarily concerned with a particular corner and storefront, this painting is of our house. This series of paintings explores familiar places that take on a very different character after dusk. This painting is still in-progress though I anticipate completing it within the next week. I apologize for the quality of the photo. This series has been notoriously difficult to photograph. Added on September 27, 2012 by Lara Hoke. Below is the most recent photo of my painting of Ben. I think (hope?) it is almost complete, but am curious to hear what you think. I am particularly interested in feedback on the sketchiness of his ear, shirt, and left eye. Added on September 17, 2012 by Lara Hoke. I am participating in a show titled "Faces" in Berkeley that opens early next month. I will be showing three pieces and--potentially--a fourth, if I can complete this portrait of Ben which I started this week. I want this painting to feel like a charcoal drawing, with the artist's hand present in the push and pull between additions and erasures. The main image below is where the portrait is now. The three images in the strip below are from earlier stages in the portrait's evolution. Added on August 9, 2012 by Lara Hoke. Our crit group met last night. I brought the two paintings I recently dusted off and am reworking. The experience was a reminder the feedback is invaluable. The comments and suggestions on where to take the paintings were much appreciated. It is easy to become blind to your work. Critiques give you an opportunity to see your work through another's eyes. During my critique, I was reminded to not get distracted by detail and to look at the shapes. I specifically asked for feedback in regards to Kim - I was concerned about how sacharine it was and wanted suggestions on how to make it less so. One group member suggested I remove the plants and pots. I did that first thing in the studio today. I also am paying more attention to the angles in the painting. In Lindsey. I removed the ambiguous shape behind her head and simplified the space. Added on July 15, 2012 by Lara Hoke. I was recently asked to show my work as part of a group show at a new gallery in Livermore, CA. The show is about the figure and being such, the gallery was interested in my older work, most of which is no longer in my possession. To meet the gallery's request, I pulled two half-finished paintings off the shelf, dusted them of, and started painting. It is fascinating and challenging working on pieces from the past. I was surprised to see how my brushwork has changed in the three or four years it has been since I last worked on these two paintings. It is looser, softer, less interested in edges. I have eight days to finish the paintings. Wish me luck! Added on November 12, 2011 by Lara Hoke. Many artists project the source image on canvas and trace the outlines. In my portrait work, I've found this approach to be helpful when working in the dry, precise medium of graphite. However, it is totally useless when I work in oil. My painting process involves loose application of paint, blending, wiping, and reapplication of paint. If I traced the image, it would be like painting between the lines or color by number. The painting would have no life of its own. In addition to overlaying the in-progress portrait over the source photo (see the previous post), I've started outlining the source photo in Photoshop and overlaying the drawn outline over a photo of the painting in progress.